The first professional wireless biking computer and mounting system for iPhone and iPod touch. 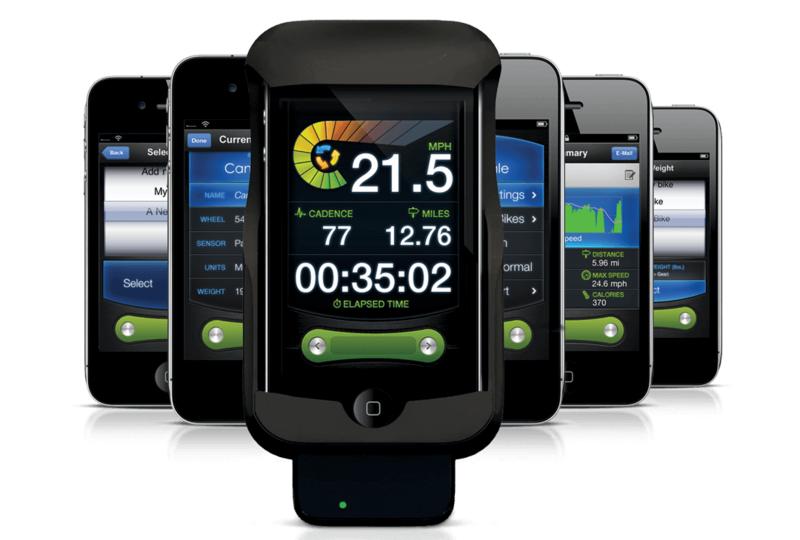 Leverage the advanced features of the iPhone and iPod touch for a hi-res color touch screen interface and GPS tracking. Transform your 30-pin iPhone or iPod touch into a professional grade wireless cycling computer. LiveRider is the first Wireless Cycling, Biking Computer and mounting system for iPhone and iPod touch. Incorporating advanced 2.4 GHz wireless technology from New Potato, a single permanently-sealed sensor unit is mounted on the frame near the rear wheel that measures both biking speed and pedal cadence and transmits that information to a receiving unit attached to the 30 pin connector of the iPhone. Captured securely in a sleek and aerodynamic shock-absorbing handlebar mounted cradle that protects against vibration and debris, the rider's iPhone is immediately accessible, yet can be quickly removed along with the receiver dongle. Unlike other biking computers, LiveRider is able to leverage the advanced features of the iPhone and iPod touch to provide the user a hi-res color touch screen interface and GPS feature providing location. LiveRider includes a file system to save the detailed data from each ride which can be reviewed graphically or exported via email and imported into any spreadsheet, document, or database. Will the LiveRider biking mount work with my iPhone 4? Yes, the Biking mount and dongle were designed to accommodate models of the iPhone up to the iPhone 4 and iPod touch. The elastomer mount naturally conforms to provide a snug fit on all models despite the small differences in form factor. What are the options for attaching the biking mount to my ride? The elastomer mount can be fashioned to the bike in a myriad of ways. Using the long rugged nylon cable ties that come with the kit for your mount, they can be tied straight or crossed as needed to ensure a solid connection. The elastomer mount has a natural gripping action that keeps it oriented as desired on the bars. yet, its flexible enough to absorb both vibration and shock easing the wear and tear on your mobile device. Can I purchase additonal sensors and mounts for other bikes? Yes, you can. We offering individual units and parts for sale, just contact us to order separate components. How do I get the LiveRider cycling computer application? You can download LiveRider FREE from the iTunes App Store either through iTunes or right from your iPhone or iPod touch using the integrated App Store utility. You can run the application without the LiveRider communication interface and see how it works. However, in order to record actual rides, you will need to purchase and have the hardware installed on your cycle. Can I export ride session bike data from the application? Yes. In the SAVED RIDES section of the app, any saved ride can be emailed from within the app. The email message can have any text you want in the body of the message while your ride data will be sent as an attachment. The data is in comma separated format in a text file that can be imported into software apps such as Excel for deeper analysis, or graphing beyond what's included within the app. Will the LiveRider application drain my battery as quickly as other applications? The power consumption of the external receiver dongle is quite low so the primary use of power when using the application is on the display backlight. You can adjust the settings of the app to either allow the backlight and display to blank to save power, or to force it to stay on indefinitely. The GPS function is run only on demand within the first release of the application to avoid a negatively impact to the battery capacity on long rides. The sensor unit takes care of making sure that the measurements are accurate and transmits the results to the receiver dongle. This keeps the load on the iPhone or touch to a minimum. If I exit the application is my current bike ride session data lost? No, your data is not lost. The external receiver unit maintains the current session statistics while it remains plugged into your iPhone or iPod. Once the app is restarted, the receiver dongle syncs to the application and your session continues forward as if the app had not exited. it is not necessary to multitask on your device to keep the session going. Can I run the LiveRider Biking app without the hardware dongle? Is it possible to charge the LiveRider concurrently with an external battery or dynamo while in use? Currently, the receiver unit occupies the 30 pin connector and has no provision for external pass-through charging. Future versions of the product may include a mini-usb input jack for this function if we receive significant interest in adding it. Is the LiveRider cycling mount waterproof? The LiveRider bike mount is a mount and not a case per se. The biking mount is made from durable elastomer and cannot be damaged by water or most any other fluid. it is intended to be fastened to your ride and left on the bike regardless of the elements. The electronics in the sensor unit are sealed to be protected from the elements and is intended to be left on the bike. The receiver dongle is docked to your device independently of the mount and can be used with your iPhone, for example, in your saddle bag, your fanny bag, or even from in the car next to you. The transmission range of the sensor to receiver link is about 40-50 feet typically. The mount is designed securely hold your device and to protect your device from debris, shock and vibration. In the future, if demand warrants, we do contemplate a waterproof version, however, for now our philosophy is to keep the solution as light as possible. Can I purchase the LiveRider Biking mount separately? Please check our web site for details or contact us by email or phone to place an order. Will LED headlamps and running lights interfere with the LiveRider radio link? Unlike many wireless solutions, LiveRider uses an advanced proprietary 2.4GHz link. It has an effective range of 40-50 ft from the sensor. Older technology solutions often use a 25KHz to 125KHz link which is only good for about 24 inches of reliable range and is easily interfered with by the switching power supplies of current cycle lighting solutions. Does LiveRider support the emerging standard known as the Ant protocol? The Ant standard is not currently used by the LiveRider Biking system as it has not yet been widely adopted and is expensive to implement. Our roadmap includes support for such devices in the future once the availability of other devices that support Ant are mire readily available and are sold at affordable price points. Is there a heart rate monitor available for use with LiveRider? Sorry, not just yet. Coming in 2014 along with other new and exciting features for our LiveRider Biking solution. In the meantime, commonly available heart rate solutions can be used without concern of interference between solutions. I ride with a group of riders, can we all be using LiveRider simultaneously? Absolutely. LiveRider uses a five byte pairing code and generates ultra-brief transmissions so there can be a multitude of systems in the immediate area and they will not interfere with each other. it is also possible for more than one receiver dongle to pair to a sensor, enabling the LiveRider telemetry to be viewed on multiple devices at the same time.